The CT970-16 is an excellent choice for affordable high-density WAN emulation. The CT970-16 is a set of 2 machines: One LANforge machine to do the WAN emulation and bridging, and an off-the-shelf managed ethernet switch supporting 802.1Q VLANs. The LANforge machine is a small appliance and the 24-port ethernet switch is a 1U rackmount unit. Neither unit has any moving parts, so they are a silent companion in the office! The user's stations plug into the ethernet switch and speak regular ethernet (no 802.1Q VLAN support is required in the devices-under-test.) 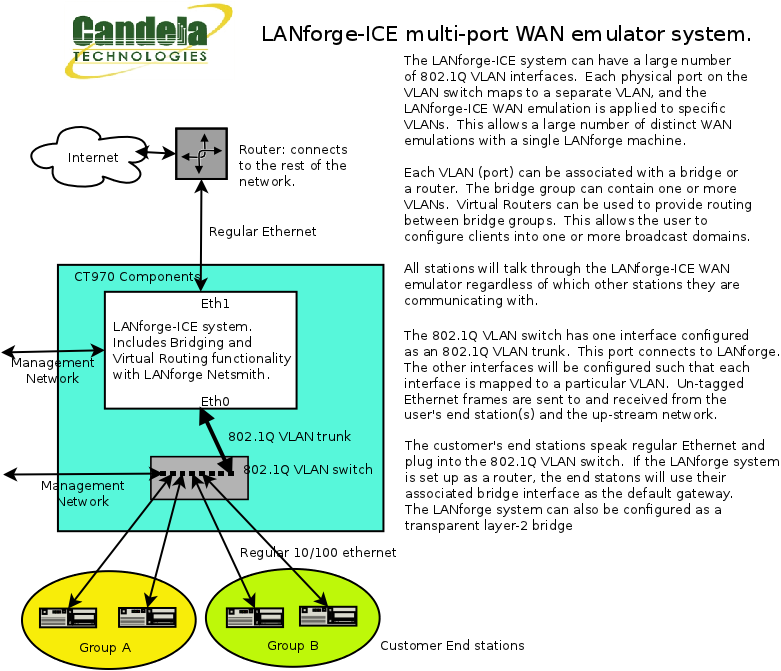 The WAN emulation, bridging, and optional virtual router configuration is all managed through the LANforge-GUI. This same general configuration can support 16 and other amounts of WAN emulations: Contact your sales representative for pricing and configuration details. The CT970-16 should now boot. If DHCP is enabled on the Management network, the CT970-16 LANforge machine will automatically acquire an IP address. If DHCP is not available, the IP address will be set to 192.168.1.101 by the LANforge start scripts. Start the LANforge-GUI on the management PC, or the CT970-16 LANforge server if managing locally, and click the 'Discover' button. It should find the CT970-16 LANforge appliance and add the IP address to the drop-down box in the Connect widget. Press 'Connect' and you will be connected to the CT970-16. 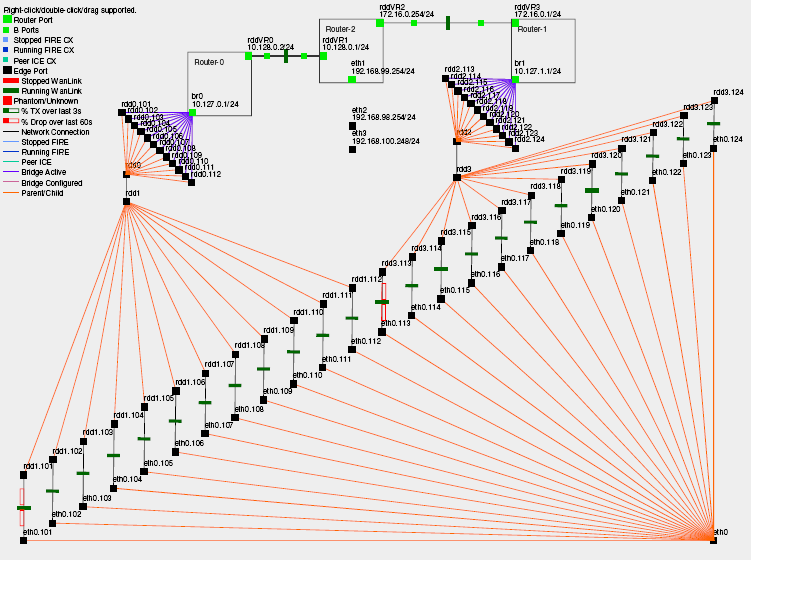 Able to simulate 16 independent DSL, CableModem, Satellite links and other rate-limited networks, from 10bps up to 2Mbps (full duplex). Total aggregate throughput will not exceed 64Mbps.